The purpose of this form is to allow the user to browse through the contents of the TASK table where TASK-TYPE = 'MENU'. This form is accessed by an option on the menu bar. For a complete description of how this type of form works please see Transaction Pattern LIST 1. Rename Will allow selected entries to be renamed by activating Rename Task. 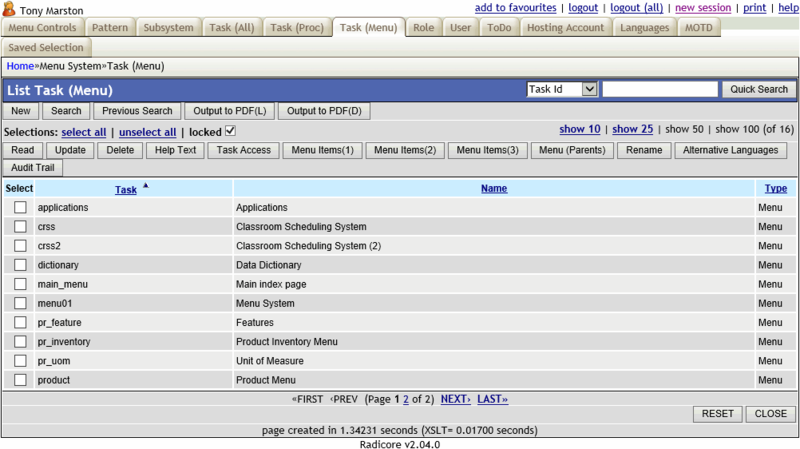 Output to PDF(L) Will produce printable output as described in Output Tasks to PDF (List view). Output to PDF(D) Will produce printable output as described in Output Tasks to PDF (Detail view). Audit Trail Will show the audit trail for selected entries as described in Appendix L.